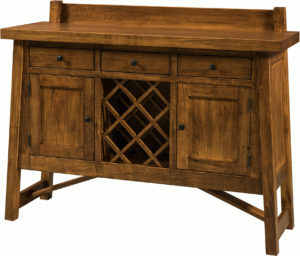 This McCoy Wine Server has the McCoy signature slanted sides and exposed tenons. 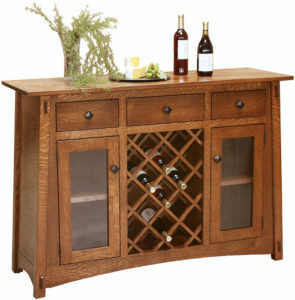 It is smaller in size than the McCoy Wine Buffet which makes it perfect for smaller spaces. It has an area at the bottom to store your wine bottles and two antique glass doors for safely displaying your wine glasses, carafes, etc. Put your wine opener and charcuterie board in the solid wood drawer. Then, you will be ready for entertaining all of your family and friends. The Amish craftsmanship you will find in this piece is impeccable. We proudly make each wine server out of only the finest hardwoods. We won’t even begin construction until we receive your order. This allows us to customize it to your exact needs. So order it as you see here in quartersawn white oak with Michael’s cherry finish or choose your favorite wood species and finish. Contact us at Brandenberry Furniture in Shipshewana, Indiana. 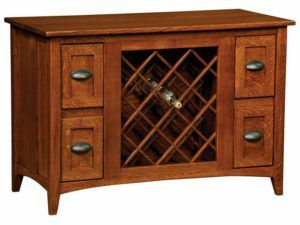 This McCoy Wine Server is an excellent choice for your entertaining needs. Choose your options and request a quote: email, call, or visit us. We would love to help you select custom options and create a truly unique piece. Be sure to browse our dining tables, chairs, and other related McCoy products so you can complete the perfect look in your dining room.